a matter of a kilometre or so past the tiny village of bridgend, as you head south towards bruichladdich and port charlotte, there is a noticeable change in road surface, one that has seen heavy wear and displays large patches of black asphalt below. the worn top coat was applied (there's another less worn section one kilometre farther along the same road) as a foil to the sudden spate of cars that appeared to be leaving the road on this particular corner including, at one point, a police vehicle. motorists' complaints rested on accusations of negative camber, one that was effectively pushing them in the direction of the ditch alongside. during the period outlined above, i was a motor car owner and often had need of traversing that very same stretch of road while teaching photoshop to a book publisher in the village of port charlotte. i can honestly say that never once did i find my motor car in any danger of leaving the road, predominantly because i never ever drove faster than 40 mph. i tend to think that the voices of complaint were to be heard from those who drove a tad faster. in mitigation, however, the modern-day motor car, no matter the price tag applied to the windscreen, continues to isolate both driver and passengers from their immediate environment. where once it would have been an audible aid to gearchanging, it is currently all but impossible to hear the engine at all, often leading to a grave misapprehension as to the nature of one's speed. the vehicles that left the road on the corner under discussion were undoubtedly driving too fast either for the road surface, their driving abilities or a combination of both. however, rather than accept this as a rather obvious fact, the roads department was forced to lay a hi-grip surface to allow those with a heavy right foot to continue to take the corner at the speeds they felt was their inalienable right. i'm sure there are examples of this sort of situation all across the country. there was a time, of course, when drivers were less cossetted in their soundproof booths. times in which they could relate to their immediate environment, whether 'twas windy or wet, when there may have been wet leaves (or barley) on the road surface and were more at one with their surroundings. it's still possible to acquire that style of motor car, perhaps most notably from the range offered by britain's morgan motors. with a current range that includes a three-wheel, classic looking vehicle, cars such as these likely still appeal to the driver who carefully chooses to wear thin leather driving gloves to grip a wooden or leather-bound steering wheel. one who delights in the variation of road camber and surface quality to be found across the uk. these individuals are not, almost by definition, motorway drivers. i was almost tempted to say, earlier in this conversation, that cars such as those from morgan most closely approximated the sheer joy of riding a bicycle, albeit with a tad more, fossil-fuel derived, power. in an obvious attempt to second-guess and outwit my simile, morgan cars have brazenly collaborated with another british manufacturing stalwart, pashley bicycles, to produce two, limited edition, morgan-themed bicycles: number 5 and number 8. both feature fillet-brazed steel, reynolds 631 frames, handbuilt in pashley's stratford-upon-avon workshops, the former with a sturmey-archer three-speed hub and the former, a shimano nexus eight-speed hub. 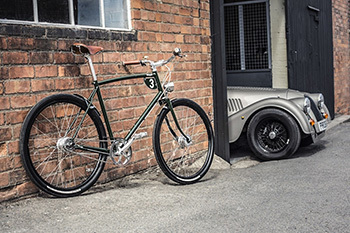 the order book for the first thirty of these bicycles is currently open at london's velorution, almost sensibly priced at £1495 for the british racing green pashley-morgan 3 or £1595 for the pearl grey pashley-morgan 8. if this is as close as you'll ever get to owning a morgan (the three-wheeler begins at £33,000), i'd click over to velorution sooner rather than later. reputedly, an intrinsic part of cycle sport is its heritage as a working man's get out clause. those italians, for example, who climbed to the top of their game in the 1950s were frequently applying their strong work ethic in a velocipedinal manner, to avoid having to spend the rest of their lives tilling soil and working the land. if success was to be found in the saddle, one annual pay day could result in a better yearly bank balance than could be realised over a lifetime on the soil. i'm led to believe the same could have once been said about the so-called 'beautiful game' of soccer/football, ostensibly the sport of the proletariat with which those, stood on the terraces, week in week out, could identify. those days are long gone. according to report in one newspaper late last year, each football match televised by sky (chris and geraint's bosses), cost the satellite supremos £16 million. economic facts such as this offer more than simply a clue as to why there are twenty year-olds being paid £90,000 per week just to kick a ball. yet, despite the knowledge that those soccer heroes earn more in a minute than most fans will earn in a day, followers of almost any football team you care to mention, apply an almost religious fervour to their devotion to the colours. it may be the eccentricities of the cycling sponsorship model that prevents any self-respecting fan from applying a similar level of dedication towards any self-contained, world tour team. it might also be the (conscious or unconscious) realisation that, though ostensibly a team sport, the majority of that team are solely employed to ensure the victory of one rider from within the many. depending on how strategies and fitness play out in either a one-day classic or a three-week tour, that protected rider may not remain the same individual from beginning to end, but i've yet to meet a cycling aficionado whose loyalty is applicable to one team, as opposed to one rider. let's face it, there are those who still idolise the likes of barry hoban, brian robinson, tom simpson or robert millar, idolatry that had them follow their heroes, no matter the colour of the jersey on their backs. it's a trend that continues to this day; there are those who fervently hope that peter sagan leaves innsbruck today (sunday 30 september) still proudly wearing those rainbow hoops that have been his for the last three years. but there will undoubtedly be far more who are rooting for other riders, none of whom will much care about which trade team jersey they would usually be seen wearing. which is why, i would contend, that cycling can be seen as more of a philosophy than a religion. the latter often encourages blind faith, a conviction that the object of devotion cannot be easily naysaid and even if it is, the naysayer is undoubtedly wrong. philosophical thought often relies on dialectical argument, that the assimilation of more than a single argument or point of view will undoubtedly lead to a stronger, third postulation. for instance, dialectical materialism looks at the relationship of the world's subjects within an environment that refuses to stand still, while, conversely, metaphysical materialism attempts to do likewise, but pertains to a more static environment, isolated from any extraneous influences. dialectical materialism was that expounded by karl marx in his magnum opus 'das kapital' and it well suits our velocipedinal purposes to misappropriate the name marx, for that of merckx, underlining my classification of cycling as a philosophy rather than floating the concept of cycling as religion. it's the very notion that demands a t-shirt, a more modern alternative to the possibility of my standing in hyde park (or any grassy knoll, for that matter) to expound any of the above theories to less than interested passers by. 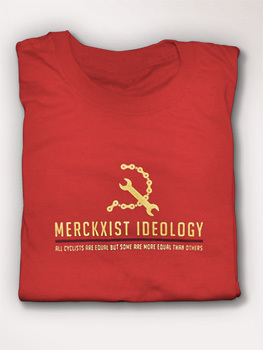 'all cyclists are equal, but some are more equal than others' a particularly apt paean to eddy, and one that features on a 'merckxist ideology' shirt from the philosophical folks at cumbria's the northern line. no matter who wears the rainbow bands after today, philosophically speaking, any one of us with £21 in our jersey pocket can wear this fetching red shirt. a friend of mine, keen to acquire a digital tablet (mentioning no names) for himself on particularly spurious grounds, was able to do so with the blessing of his other half, by purchasing one for her too. there was little in the way of gauging whether his spouse was likely to make use of such a device, but in truth, that was merely incidental to his original purpose. it's a strategy that many will have had to resort in relation to those frequent bike rides. though the term 'golf widow' entered the modern-day lexicon some number of years ago, on the basis that cycling has been oft proposed as the successor to hitting a ball in the direction of a small hole, it would not be too much of a supposition to now accept that there is such an individual as a cycling widow. by use of such terminology, i do not mean to corral the phrase to simply refer to the female of the species. in the case of helen and stef wyman, there's little doubt as to who is the widow. in an ideal world, both parties would either participate in the velocipedinal realm, or the potential widow would also have a similarly obsessive activity in which they could immerse themselves. the latter scenario is undoubtedly the most preferable, if only to forestall the accusatory stare that usually accompanies announcements such as "right, i'm off out on the bike." however, the curation of such a state of affairs on a regular basis can prove every bit as exhausting as a 100 kilometre ride before lunch on a saturday, double-egg roll or no double-egg roll. what's necessary in this instance, is undoubtedly some sort of consistency, the sort of reasoned excuse that will bear close scrutiny, without the possibility of any unforeseen loophole being uncovered. and, to be quite frank, that's a harder ask than it may at first seem. simply stating that i've "not been out all week", is unlikely to cut the mustard with a spouse who, in the case of mrs washingmachinepost, has scarcely stepped outside the four walls of the croft all week. several of my colleagues have made mention of the inquisitor in the house when suspiciously-sized packages arrive in the mail. i'm sure many find themselves in similar circumstances: "why do you need different tyres? ", "what was wrong with the bar tape you bought last january? ", and "that saddle looked fine to me." i know you know of which i speak. happily, i have the perfect excuses, not only with regard to cycle products, but also those of a percussive nature. the latter can be explained away by my tutoring at the local secondary school, the former immediately related to these very pixels. the majority of unidentified packages are, more often than not, items for review, a situation that has existed for many a long year and one with which mrs washingmachinepost is more than comfortable. one of the secondary benefits to this, is the categorisation of any bicycle-related package under such classification, whether that's the case or not. a win, win situation as far as i'm concerned. but when it comes to heading off into the wide, grey yonder, even if it's only playing hooky from work on a friday afternoon, i can play the 'necessary review period' card, whether 'tis true or not. 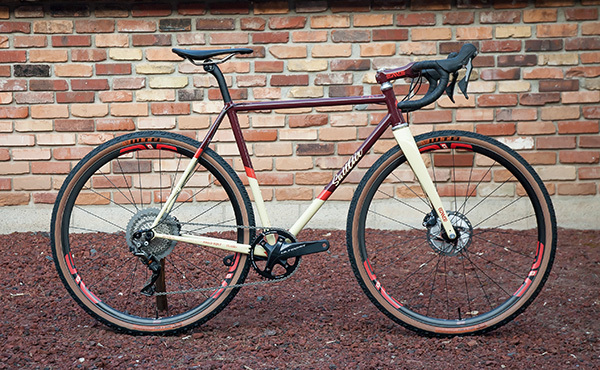 though my current go to bicycle is a chorus-equipped, ritchey logic, there the comparison with the bicycle's originator, tom ritchey, effectively ends. or does it? if you'd care to refer to my interview with the great man in january 2017, you will learn that his earnest mantra is 'my bike is my office', an epithet that i think i may have unwittingly adopted. and in order that this concept remains front and centre, simon beatson at ritchey europe very kindly sent me a few frame/helmet stickers bearing those very words. if i were you, i'd give some serious thought to quite how you might engineer a similar set of circumstances applicable to your own situation. not only could it be your 'get out of jail free' pass, but it might completely alter the meaning behind the apocryphal statement uttered on one's deathbed. i received a press release regarding the imminent release of gerard unger's 'the theory of type design' some weeks prior to its release date of 20 september and took the opportunity to request a review edition from nai publishing to feature in these black and yellow pixels. not entirely unexpectedly, i received a confused reply, offering alternative, bicycle-related titles that were thought to be more appropriate for a blog concerning itself predominantly with road-going bicycles. 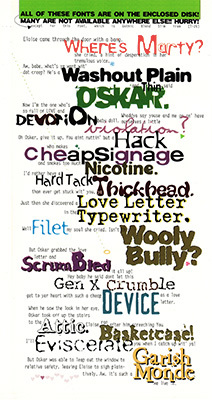 argumentative to the last, i replied, including links to previously published articles in which i had featured aspects of the typographic world, relating those to the bicycle stuff that constitutes the bulk of thewashingmachinepost's considered output. it appears that i made a convincing case, for a review copy duly arrived. for those every bit as confused as the publisher's publicity department, let me offer a brief explanation. cast your eye briefly to the lettering at the top of this page, announcing that this is indeed, thewashingmachinepost. the tyepface in which this is constituted emanates from delaware's house industries and is entitled velo. the late rich roat of house was kind enough to send the image from which my heading was extracted, prior to my purchasing the entire font. 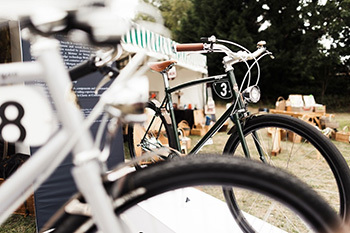 this excellent typeface is available not only on the downtube of exhibited steel bicycles, but decorating a wool cycle jersey, casquettes and several other bicycle related items. because, like it or not, type plays its own considerable part in the life of the bicycle. with the ever increasing size of the road bicycle downtube, the manufacturer has a larger area of real estate on which to advertise the bicycles origination. and in a world where the bulk of today's peloton is born in a handful of taiwanese factories, designed by computers running the same software programme, differentiation has become the name of the game. 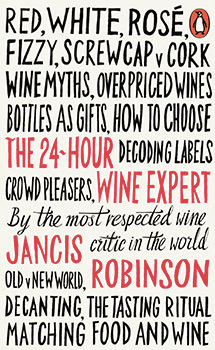 what better way to accomplish this by way of the stylistic application of a memorable, high profile typeface? you may well be able to reason that type design impinges not upon your day to day, but i, for one, would beg to differ. and, to a certain degree, i'm sure that mr unger would wholeheartedly agree. i cannot disguise the fact that 'the theory of type design' is a particularly learned work, heavily slanted towards the academic approach. that, in essence, may restrict its attraction to those of us concerned with the minutiae of type design; how varied are the counters; are the descenders long or short; does the kerning work every bit as well at headline sizes as it does in body text format? you'd probably think such matters to be beyond the scope of the average cyclist and you may well be correct. but if nothing else, it may help explain why some downtube lettering looks a tad better than its neighbour. 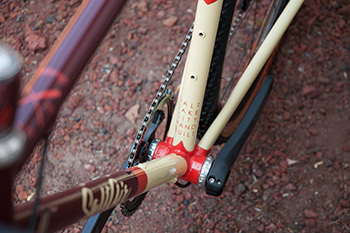 in his revered book 'one more kilometre and we're in the showers', author tim hilton points out that there is a disproportionate number of individuals with artistic/design leanings, a fact no doubt considered by the majority of cycle manufacturers when debating the graphics and lettering applied to their products. 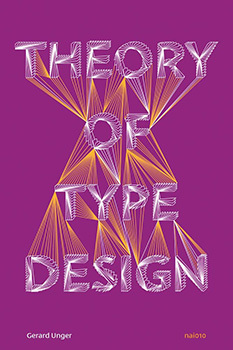 for those who identify with hilton's assertion, a copy of 'the theory of type design' may prove every bit as essential as a copy of peter sagan's forthcoming autobiography, or 'les cartes du tour' by paul fournel. gerard unger opens the first paragraph of his first chapter with an undoubted truism. "Of all designed objects, letters are probably the most pervasive, very familiar, yet amazingly diverse in their appearance." it is this very diversity of appearance that provides cycle manufacturers (for example) with the means to differentiate their product from the competition. but in so doing, it is necessary for several someones within the industry to have the knowledge expounded within these 25 chapters. so, i hear you ask, why would any of this be of concern to me? well, other than those who approach their local bikeshop, velocipede in hand, to greet the mechanic with 'it's making a grinding noise', the intricacies of carbon fibre and its technical appendages are often of great concern to members of the pelotonese. we are renowned for spending many a happy hour or so, discussing the relative merits of double-tap and ergopower, educating ourselves as to the potential advantages of a twelfth sprocket, and learning of the improved rolling resistance brought about by a few extra millimetres of rubber. 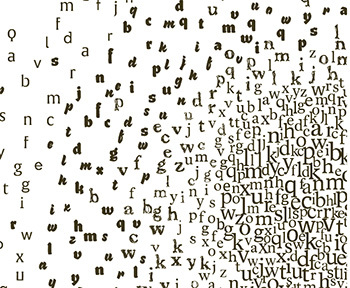 "The world would be less interesting and navigable if all the messages around us would be uniformly designed with one single typeface." i appreciate that i am here preaching to a particularly narrow field of interest, that the majority will be more concerned with which specific jersey or jacket would be most appropriate for the weather conditions at hand. the size or flavour of lettering plastered about a dod of crafted carbon fibre is surely of secondary concern? but it would be particularly naive of this review to constrain appreciation of the humble and not so humble typeface to its tentative relation with the bicycle. the study and appreciation of typography is one that can be enjoyed entirely for its own sake and one that i've found to be particularly rewarding. the author illustrates his points with considered aplomb, appending many an intriguing example to the latter portion of each chapter. even cursory study of this publication might well aid your choice of typeface if commissioning business cards, designing a fundraising poster or, to briefly return to the bicycle, leaving a well-designed note explaining that the bike shop is closed because you've gone cycling. 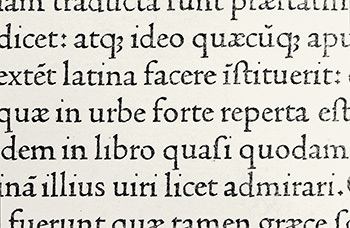 for those approaching the subject from a position of professed ignorance, unger is not only an accomplished typographer, but an admirable writer. aside from citing a wide range of original sources, his explanation of the nooks and crannies of type design are as clear as plate glass and, dare i say it, make for (relatively) compulsive reading. unlike many other so-called type manuals, unger has not set out to assist you in the identification of every typeface you come across in supermarket packaging or the exhibition stands at the cycle show. but he will help you understand why the spacing doesn't look quite right on your 'who the hell is peter sagan?' t-shirt. one of the christmas list. motor traffic in the hebrides, at least this particular part of the hebrides, is relatively light, when compared with urban and city areas on the mainland. the busiest times in bowmore are, inevitably, much the same as those elsewhere, as folks drive to work and drive their kids to school. for those somewhat aghast at the notion that schoolchildren in such a small village (one mile end to end) have need of riding in a motor car to attend school, you'll certainly hear no argument from me. however, whereas there are endless schemes in mainland locations to discourage this practice in favour of either walking or cycling, no such advice exists this far west. and whether as a result of this or not, i know of no children who cycle regularly to primary school and definitely none at all at the local high school. the oddity inherent in current law means that it is illegal for anyone of driving age to drive a car without at least a provisional licence and without a qualified driver alongside in the passenger seat. let's not pretend otherwise, even the smallest of motor cars can be considered a lethal weapon in the wrong hands; to let a learner loose without supervision is quite likely asking for trouble, no matter how many times they've played 'grand theft auto'. i recall, in my youth, being required to sit the cycling proficiency test (now renamed bikeability) a practical and theory test that allegedly prepared primary age kids to join the congested throng that passes for our modern transport infrastructure. gaining a pass in this test, promised receipt of a triangular, enamel badge and a certificate, proving, if proof were needed, that the bearer was apparently attuned to their place in the hierarchy. unfortunately, unlike the driving test, bikeability has no teeth. any kids who fail to pass, even badly, cannot be prevented from hurtling out into town, city or village traffic, irrespective of their cognition of the dangers that abound. as i have made mention on many a recent occasion, islay abounds with large, forty foot, articulated tankers making daily trips to and from the eight currently working distilleries (a ninth is due to come on-stream within the month). these are augmented by similarly sized trucks bringing supplies to the local averagemarket and the aforementioned distilleries, to say nothing of the occasional service bus or tour coach. though i've found the drivers of these vehicles to be particularly cognisant of the sunday morning peloton, even when it's not sunday morning, primary school kids on substantially smaller bicycles may not be particularly visible, nor as predictable in their velocipedinal ministrations. particularly those who either failed or failed to undertake the proficiency test. though i'm keen to point out this glaring aberration in the law as it pertains to road safety, i'd be fibbing if i said i have any solution. however, the head teacher of a london school appears to have taken a stab at a potential remedy, insisting as he has, that pupils riding to school must attach a school-issued number plate to their bicycles. 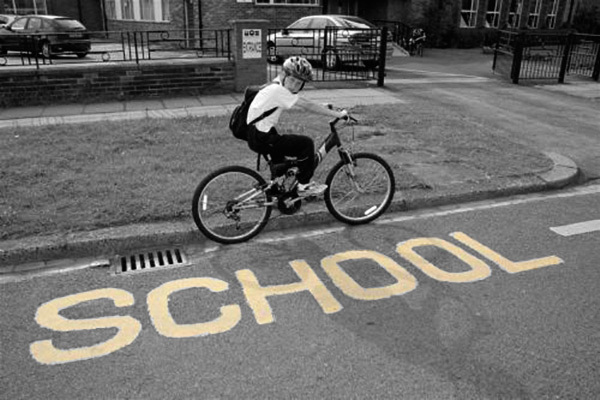 failure to do so, will result in pupils being denied the opportunity to cycle to school, or to lock their bicycles within the school playground. what i've been unable to comprehend is quite how the addition of an arbitrary number to a bicycle frame will make any appreciable difference to their safety while thus travelling to school? granted, the headteacher claims that the reasoning behind his rule has less to do with safety and more to do with members of the public being able to identify those preceived to be riding unsafely or dangerously. which, if he doesn't mind me saying so, seems to be an odd way of going about things. rather than leave his young charges open to public complaint and identification, woud he not be better to educate them as to the sort of safe-cycling behaviour he expects from his pupils. perhaps by insisting that only those sitting and passing the cycling proficiency test are allowed to cycle to school? would that not be more in keeping with the role of a professional educator and more closely allied to the ideals behind the driving test? here's hoping he is given cause to reconsider his action prior to the start date this coming monday. it's a sad way for a quality bicycle frame to head for the scrap heap, but my colnago c40 hp bit the dust due to invasive corrosion of the aluminium rear dropouts. the irony of the situation is that, in preference to a steel frame, i had purchased cambiago's ferrari carbon fibre in the ultimately mistaken notion that, since carbon doesn't corrode or rust, this would have been the very machine to see me safely through the winter months. however, the first signs that this might not have been the wizard wheeze it was once thought to be, was an inability to backpedal in the early days of spring. 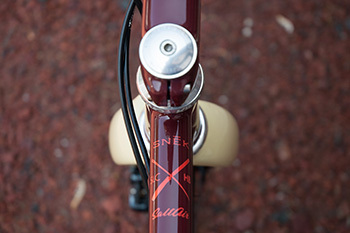 on closer examination, it was disappointing to note that the aluminium rear dropouts had coated themselves with the alloy's equivalent of rust, expanding the width of the drive side just enough to trap the cassette and prevent it from rotating backwards. despite using a wire brush to rid myself of the bulk of this powdery substance and finishing off with a small, fine file, the process of degradation continued, until eventually the dropout plugs inserted into the carbon stays exapnded, effectively destroying the frame's integrity and rendering it unsafe to ride. to an extent, this sort of thing was inevitable; i'd also lost two sets of chris king hubs to a similar ailment affecting the spoke holes. despite quality anodising, substantial sections of the hub flanges broke off. responsibility for this state of affairs can be laid at the feet of two miscreants: peat and the north atlantic ocean. the former, as i was informed by an engineer at chris king components, is acidic and, as we have a substantial amount of this blowing about on islay's roads, it was pretty much always going to have an adverse effect on the lower portions of my colnago. added to that, there are very few, if any, areas on islay that are sufficiently far removed from the sea, to remain unaffected by the salt air. and galeforce winds and horizontal rain are ready and willing to intervene should dry land get in the way. embarrassment has often been mine as i packaged a review bicycle for return to its original home, noting that the stem bolts and cable clamps are all suffering from ferrous oxide after only a matter of a few weeks in the hebrides. to be perfectly blunt, nowhere is safe. but it would be wholly insensitive to castigate sodium chloride in a totally bad light; though i never, ever, add any to my daily plate of porridge, mention salt lake city's salt air cycles and nothing but good thoughts will ensue. also domiciled in salt lake city is jonny hintze of snek cycling, purveyor of possibly the finest pair of merino armwarmers in my armoury and inventor of a tubeless tyre lever that is the boss of all others. conjoin mr hintze with salt air cycles' matt nelson over a predominantly cyclocross based conversation and suddenly salt is the flavour of the month. (so to speak.) 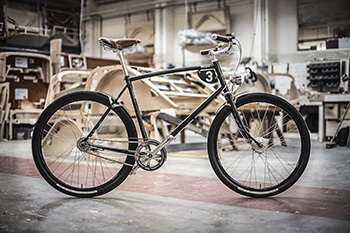 between the two of them, they have produced one of the most attractive-looking, yet functional cyclocross bicycles to be seen in recent times. having met at last year's north american handmade bicycle show, hosted in salt lake city (where else? ), they formed a loose partnership that has resulted in a handbuilt steel 'cross frame, the decor of which has benefitted from jonny hintze's background in graphic design. according to matt, "jonny's keen eye for a clean/modern cycling culture aesthetic led us to collaborate on a kit design..."
the bicycle features a modified, single-chainring ultegra gearset, accessorised with classic silver chris king components and a complete enve cockpit and carbon fork. "...to make the ride as comfortable as possible." 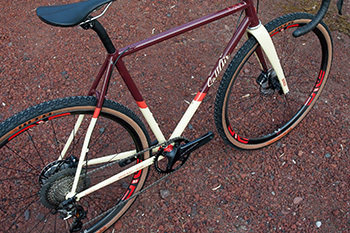 though the bicycle is built for racing, it offers sufficient tyre clearance to double as a gravel bike with larger than the regulation 33mm width. 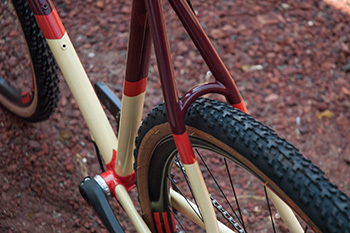 and not to be underestimated is the glorious paintwork, replete with highly attractive salt air script on the downtube. this snek/salt air collaboration may currently be a one-off, but i'm willing to bet that messrs hintze and nelson would be happy to provide you with one of your very own, were you to cross (see what i did there?) their palms with silver. bike shops. do we need them? if you were me, or, more to the point, if you lived somewhere as remote, the notion of a bricks and mortar bike shop holds considerably less sway than might be the case in the world's more heavily populated areas. granted, if my interest were to be piqued in a specific brand or model of bicycle, i have the option of travelling to a town or city wherein there might be a dealer stocking the very velocipede of my dreams. but, without wishing to lean heavily on the sympathy card, any such viewing trip can never be less than three days and involve at least two nights in some form of (probably not inexpensive) accommodation. this state of affairs holds true for pretty much all island dwellers in relation to any given product and to a slightly lesser degree, those living in any remote location that is devoid of a bikeshop. this effectively means that the only economical recourse available is the much maligned online store, sets of pixels that have been cursed as preparing the downfall of real bike shops. though i recall criticising the trek bicycle company several years ago for what appeared to be a backward step, curtailing their stockists in offering mail-order delivery of any bicycles from the trek range, perhaps i was too quick to judge. if i might refer to my opening paragraph, this diktat from wisconsin, threatened to alienate remotely located, potential trek owners, a three-day trip as described, merely adding to the cost of ownership. however, perhaps trek had the best interests of their stockists at heart, making a convincing case for the continuance of real bike shops in the face of pressure from the interweb. in retrospect, if the majority of cycle manufacturers had followed suit, there would be little alternative to a bikeshop visit. and as the machinery becomes ever more complex, by way of batteries, switches, hydraulics et al, the need for a trained mechanic to offer a professional service would surely guarantee the persistence of the bike shop well into the future? to reiterate a well-worn hashtag #theinternetwontrepairyourbike. at one time, all bicycles adhered to what is currently described as a traditional frameset, prior to mike burrows launching the sloping tube on an unsuspecting public. this is precisely where the confusion may arise. colnago, in particular, deduct the centimetres; a 54cm traditional frame equates to a 50cm sloping. or does it? 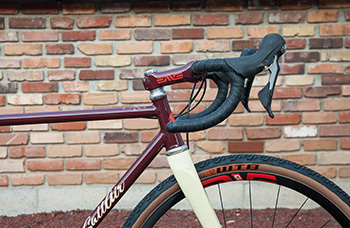 because many other manufacturers simply keep the same frame measurement, but slope that top tube anyway. you have to agree, that makes valid comparisons a tad more difficult. wouldn't it be a lot easier to simply try one in-store? while that's the only option with trek (and reputedly the reason they banned home-delivery), it's plainly not an option with canyon. and it's not much of an option for those geographically estranged. so where does that leave the humble (and not so humble) bike shop? sadly, the decision might be in the process of being made for us, whichever side of the coin you'd prefer. a matter of a few days ago came the news that one of britain's largest chain of bicycle stores, 'evans cycles' began seeking a new buyer, requiring a reported £10 million before the end of the year to forestall bankruptcy. as i'm sure i've mentioned previously, evans are not the only cycle retailers to have felt the pinch recently. expansion seems to have come as a result of the 'bradley bubble', which, i think we might reasonably agree, has well and truly burst. does this potentially mean that the cities and towns of the world will soon resemble that of latter-day beijing, featuring cycle repairers on many street corners, or working from domestic garages. as i've mentioned above, #theinternetwontrepairyourbike and tautologically, no bike shops pretty much entails no bike repairs. maybe. i doubt that modern-day economics supports the existence of bike shops simply because we want them to. any shop has need of generating sufficient profits to remain in business, but ironically, it may have been the rise and rise of the bigger chains such as evans, cycle republic, halfords, edinburgh bicycle co-op, et al, that hastened the demise of the small, individual bike shop, unable to compete with the buying power of their big brothers. so, my argumentative querying as to the continued need for bike shops might possibly be rhetorical. however, in the meantime, we may take succour from the knowledge that the compact disc and digital downloads have yet to successfully kill off the resurgence of vinyl. nor, despite its best efforts, has amazon managed to clear the high street of its bookshops. 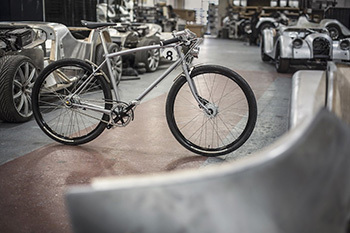 i'm sure there will be more manufacturers in the future who will embrace the online store in the quest for improved profit margins, as indeed might component manufacturers, creating greater need for traditional bike shops to change their modus operandi. after all, assuming you've chosen a frame-only purchase from the likes of canyon and a groupset from one of the big three, someone is going to have to join the two together. whether or not you need a bike shop, depends greatly on your location, allied to your own mechanical ability and knowledge. maybe there's an opening for a new career as an online bicycle consultant?